Mark Foley, Jr. is the 2015 Business Person of the Year. 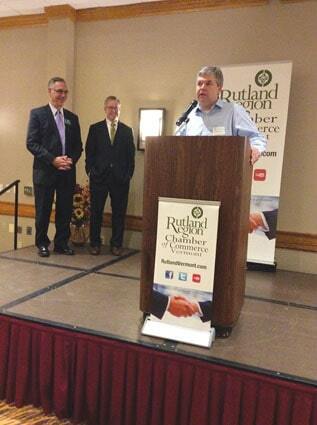 RUTLAND — At the annual meeting for the Rutland Region Chamber of Commerce held Wednesday, Oct. 28, Mark Foley, Jr. of the Foley Family of Companies and MKF Properties was named the 2015 Business Person of the Year. The honor was awarded to his father 11 years prior. The recognition came as a surprise to Mark Foley, Jr., who accepted the award Wednesday and thanked the city and its people for supporting his businesses and growth. The meeting featured a keynote address by Art Jones, president of Great Jones Productions. Jones is best known locally as the director of “The Blood in this Town,” a documentary that used the 2009 Gift-of-Life Marathon blood drive to illustrate a struggling mid-sized city’s drive to revitalize, which was “all fueled by citizens who’ve put aside their differences for the good of the town,” according to a statement by Great Jones Productions. Jones spoke passionately about how the “Rutland model” has inspired other towns to seek similar growth; how the continuous economic ingenuity of the people in the Rutland region continue to fuel growth in often unexpected ways. Jones admitted that early on even he would have considered Green Mountain Power’s Solar Capital initiative to be a bit of a stretch, given the lack of sun the region gets. “Maybe in Arizona, but Rutland?” he asked. Yet, it happened. And today, Jones is not surprised. “Rutland is the model, I’m here to reflect it back to you,” he said, adding that the region is fertile ground for investment and entrepreneurship. The luncheon meeting, which takes place at noon Wednesday at the Holiday Inn, also includes a review of the chamber’s accomplishments in the past year and a preview of its plans for 2016. Outgoing board members Phil Alderman of Alderman’s Automotive Group and Jay Morel of Diamond Run Mall were also honored for their service to the Chamber.